Advisor and team information compiled and verified using a patent-pending process for ensuring data quality. In recent years, more than 50% of wirehouse advisors began working on teams and the trend caught on quickly for independent advisories. Team data, including accurate contact information and registered and non-registered team roles, is in high demand as it helps drive intelligent distribution and improves report quality. The challenge for most firms is the constant change in the composition of teams and their members. On average there is a 5-10% monthly change in financial advisor data. Advisor Atlas updates and checks thousands of records every week using its proprietary data collection and dynamic architecture method to accurately track and deliver team data to several of the largest U.S. asset managers. In SalesPage, Advisor Atlas team data is matched to your master client data, the gold standard for firms, offices/ branches, reps/ advisors, and partnerships/ splits. Advisor Atlas data provides a supplemental perspective for your master client data, one that can be used to update or add to it, using an appropriate blend of rules-based processing and manual stewardship. If you also subscribe to SalesPage’s data services, we can manage both the rules and stewarding the data, providing you with standardized, stand-alone data files that are consolidated and can be easily consumed by your enterprise systems. For firms that are starting to build out team and partnership intelligence, the SalesPage Advisor Atlas team bundle provides the data, ensures that it’s updated in the master client data source, and enriches your team knowledge over time. For firms with existing intelligence from an internal source (e.g. identified by your sales team) or another third-party provider, this bundle enriches that intelligence with another source. You are always in charge of your data: you can determine the rules that prioritize and rank your sources. For example, a rule can indicate that if Advisor Atlas has a team record where the master client data has none, a team is added automatically based on the Advisor Atlas data. Or, if Advisor Atlas data conflicts with the master client data regarding a team, a rule can flag the Advisor Atlas team for review by a person who’ll decide how to use it. 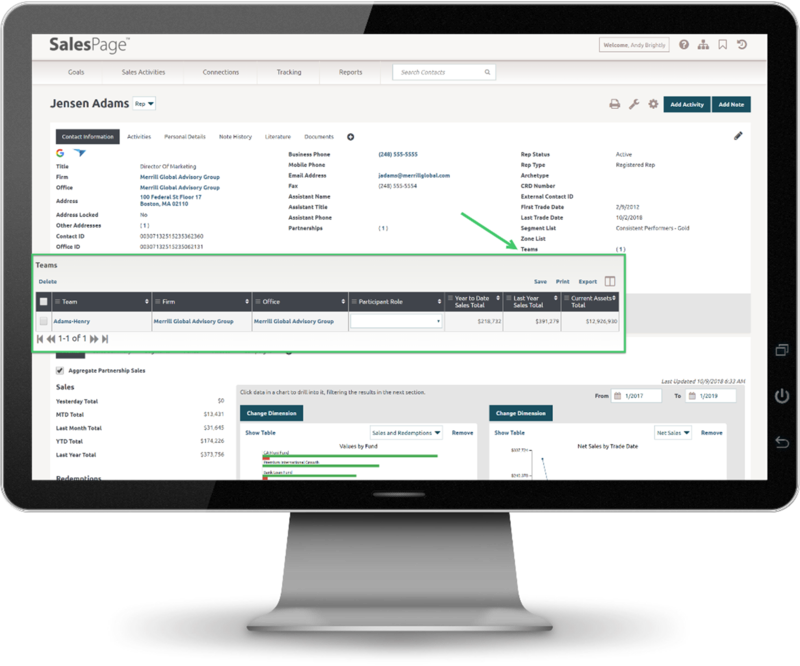 Your operations team—or, if you subscribe to our data services, the SalesPage team—can work through data flagged for review, choosing if and how information in the master client data should be added to or updated based on Advisor Atlas data. Bundled within our client data platform, which provides the best team management tools coupled with the best team data, in a single platform that can be leveraged across the entire asset management organization. Delivered through our data service, which provides a standardized file set that’s easily consumed by your downstream systems. Looking to augment your database with advisor team data?